Ah, Wednesday: Time for middle-of-the-week celebrations, new comics, and… iOS 8 extensions? Yes, indeed: AgileBits, the developers behind 1Password, have released a Github repository containing all the stuff that other app makers need to include a 1Password extension in their programs. The video demonstration shows a sample browser app with a 1Password button that, when tapped, opens up the Share sheet and extensions menu. Tapping the 1Password button prompts the user to unlock the extension using Touch ID or a passcode, then to select the correct login for the application. 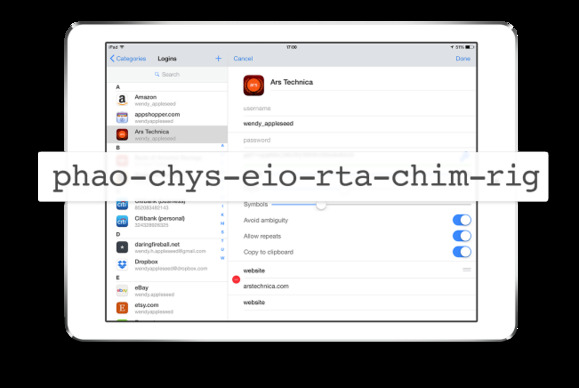 Though not shown in the video, third-party applications will also be able to take advantage of 1Password’s auto-password-generation service, according to AgileBits’s Github documentation, and remember new logins as well as filling in saved ones. As anyone who’s used the 1Password app on the Mac can attest, being able to seamlessly select and fill in your saved passwords from within other apps makes the extension approach an incredibly appealing alternative. Currently, iOS 7’s limitations make that sort of fluid inter-app operation impossible. Instead, you have to manually switch to the 1Password app, log in, copy the proper password, then switch back to the app or website in question. The 1Password extension looks to bring something close to feature parity with its Mac sibling to iOS—which is very good news for those of us that value easy password security.